There are certain things a salad needs to make my husband and kids want to eat it. 🙂 Of course there’s ranch dressing- but it seems to them (especially my son and husband) a salad wouldn’t really be a salad without the croutons! 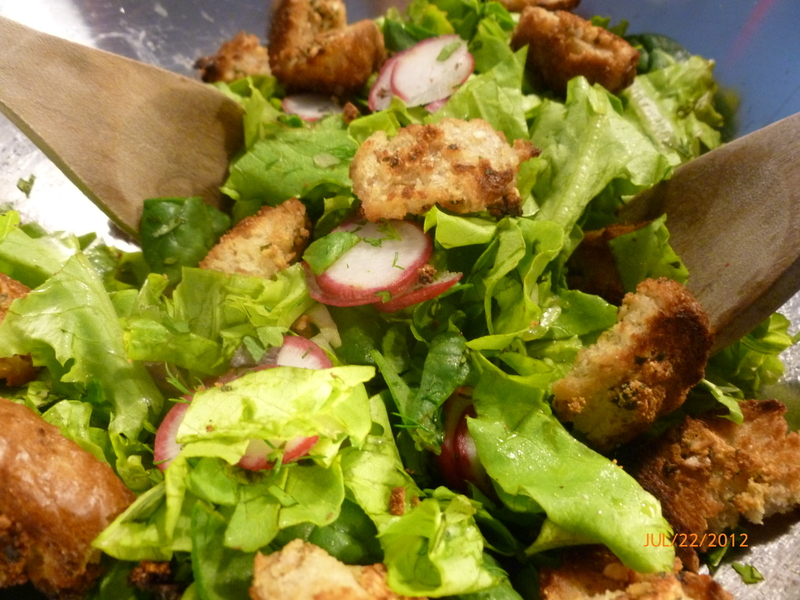 So- with all of the fresh lettuce, cilantro, radishes, spinach, basil, and sage growing in my garden to make nightly salads with- I had to come up with some way to keep croutons available at the house without having to buy them every week. Here’s a simple recipe for those of you who have fresh herbs from gorgeous garden growth like I do and some few day old bread (homemade, storebought, whatever your fancy or whatever you have available). 1. Melt butter in microwave in a microwave safe bowl until only liquid. Add minced onions and stir together. 2. Mix together finely chopped sage, thyme, and basil with the garlic salt in another bowl. 3. Dip pieces of bread one at a time into the butter then roll in herb and salt mixture. Place onto a small aluminum foil covered pan to fit into a toaster oven. 4. Once all pieces of bread are coated and placed on pan- top with any other “additions” you have come up with (garlic, cheese, etc). 5. Toast in toaster oven at 420 degrees for about 3 minutes or until browned (not burned). There really is such a peaceful serenity when one is involved in the gardening process. The sounds, sights, tastes, and feelings you experience all amount to such a wonder- that one can be curious as to why someone wouldn’t want to have their own garden. 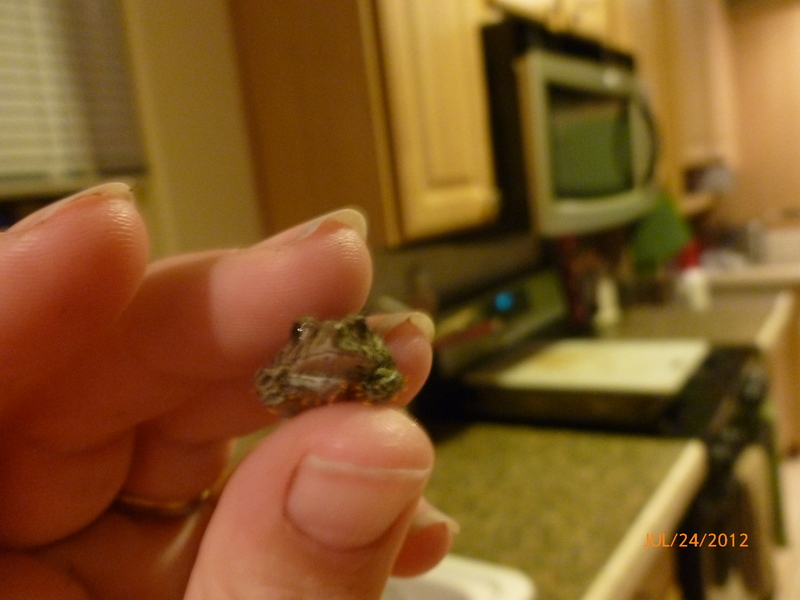 The photo of the small frog above is an enhancer to my point of the peaceful sounds in a garden. As the evening creeps in after a long day of succumbing to the calling of a day job, of a husband, of children, and of farm animals- it is nice to sit in the area of growing produce and just listen to the near silence of frogs croaking. Doing the early evening gardening chores and listening to the simple sounds of nature is actually quite the break from hearing customers on the phone, hearing my husband say “Hey babe, can you…”, hearing my children bicker and argue, and hearing the goats and pig bray or grunt for attention. The silent sounds in a garden are a positive shelter for the ears. Having some experience in gardening times past, I know that patience is well rewarded when blooms begin to burst. This was my first year planting some bulbed flowers in the spring however, and I was very unsure of the turnout. 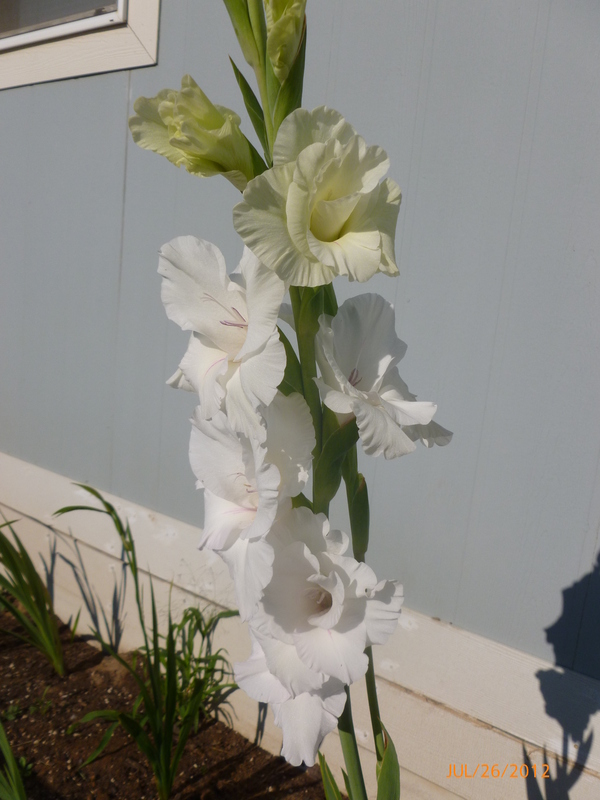 As these Gladiolas got taller though, my anxiousness got settled. Soon some lovely wedding like white flowers began to poke through the long stems and my joy was so overflowing that I’ve been bringing these lovely petals up in coversation everywhere. Whats even nicer, is that not all of my floral plants bloom at once so I get to keep experiencing the joy of each one opening up to the birds and bees of the world around. Another simple joy from gardening: the wonderful visual blooms of God’s great aesthetic design on plants. And while you’re at it- why not grow food that is both pleasing to the eye and to the pallet!?! There’s nothing like the taste of your own lettuces, spinach leaves, radishes, onions, and herbs all diced up together into a salad. I know they don’t just taste better because their so fresh and organically grown – it’s also because you put your time, love, and energy into making sure they turned out the best they could. Even the children and husband eat a few greens when grown by ourselves. Gardening makes for a great money saver at the grocery store as well! Thinking back- I spent maybe $1.00 on the packet of lettuce seeds- and how many salads can I make out of it? Enough for a daily dishes through the summer and some to share with neighbors too! Another garden pleasantry- food for the stomach and the soul! 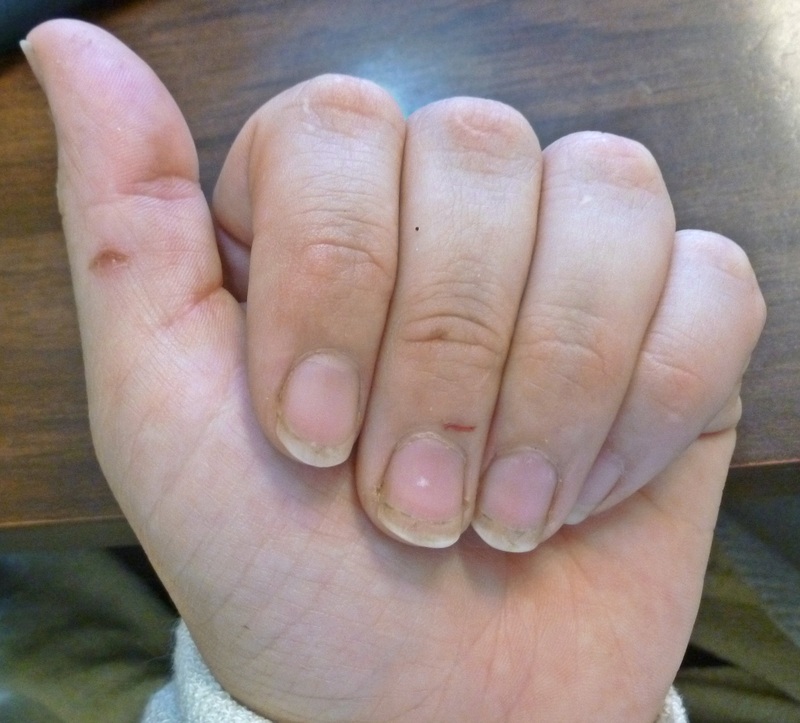 I’ll have to admit- having little scratches from thorns or getting dirty fingernails can be frustrating- but weeding through, thinning, and replanting items in the garden area can be so therapeutic. Such a “mindless” activity in a sense that it leaves room in the brain to consider other feelings of the day. The ‘work’ in a garden allows for one to just take a breather- a combination of being alone and working physically with one’s hands helps to remind ones self that some of the little things bothering the heart and traveling through the body are so miniscule in the scheme of life. Although I love the help of my family while we build a garden together- sometimes I enjoy the “me time” that comes from it too. As you can see, I love my garden time. Do you? What frustrations do you have? What are your positive wonders? I’d love for you to share! With weather in the 90’s now I need to get up in the morning about 5:30 to get started on watering my garden before I head off to work for the day. Since I am up so early- I thought I’d come up with a way to make a good breakfast for my kiddos without heating up the house. I don’t have a bread machine, and I have read in various places online that you can make bread in a crockpot. So, in effort to make something totally inventive, I made up my very own fruit bread breakfast recipe for the crockpot. It is not a fluffy bread, but rather a moist and slightly sweet bread. I didn’t want to copy any recipe for bread that I had in my cookbooks- so I just mixed together many of the common ingredients of breadmaking and came up with this. I was pleasantly surprised and hope you’ll enjoy it as well! 1. After mixing each bowl of ingredients, pour bowl number 1 mixture into bowl number 2 (liquid to dry). 2. Stir and knead mixtures together until you have a dough. 4. Place a few cups of water into the crockpot and place wire rack inside of crockpot (there are other varying ideas if you don’t have a wire rack- please contact me and I’ll be happy to share). 5. Place loaf pans onto wire rack and put lid on crockpot. 6. Turn crockpot on to 375 degrees and bake for 1 1/2 to 2 hours. Insert toothpicks towards end of baking time to see if done (toothpick will be clean). 7. Remove pans from crockpot and turn bread over onto a cooling wire rack. 8. 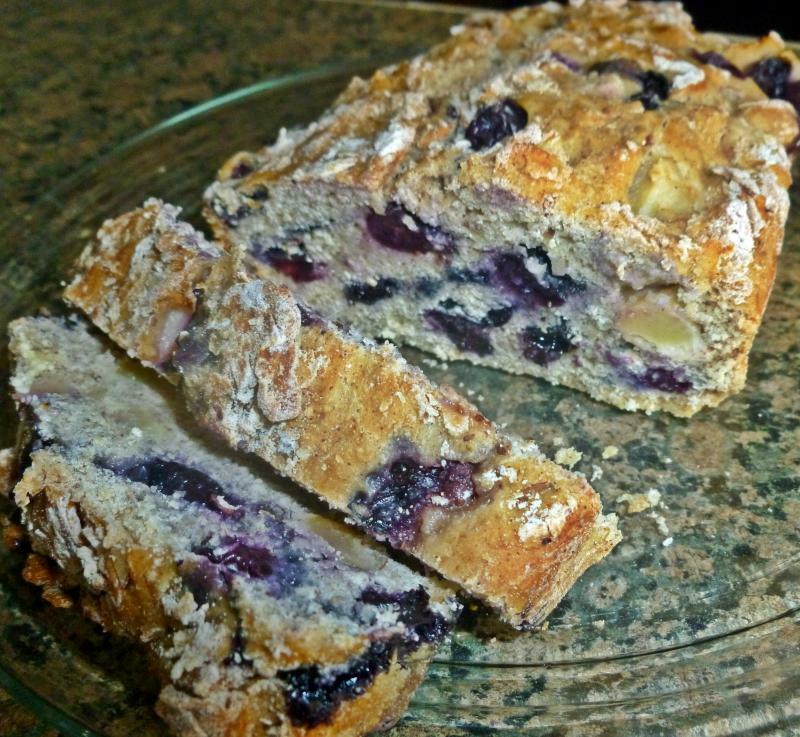 Slice and serve with butter and honey for a great breakfast treat! Why the name “Eve” in the title of this recipe? Because this delectable apple dessert is so sinfully tempting. And why only a recipe for one? Because you won’t want to share this delight with just any Adam. After coming up with this the other night, I had to make another one the next night- it’s THAT good. A combination of fruit, spice, and ice cream that takes you into a relaxful bliss- making you feel almost ashamed to be eating it while taking a bubble bath in your birthday suit. 1. Peel apple before slicing off small “chip” size pieces until you are down to the core. 2. Put apple pieces, butter, brown sugar, honey, and cinnamon all in a small saucepan and heat to boiling- stirring often. Lower heat and let simmer for a couple minutes until apples are tender and sauce is syrupy. 3. 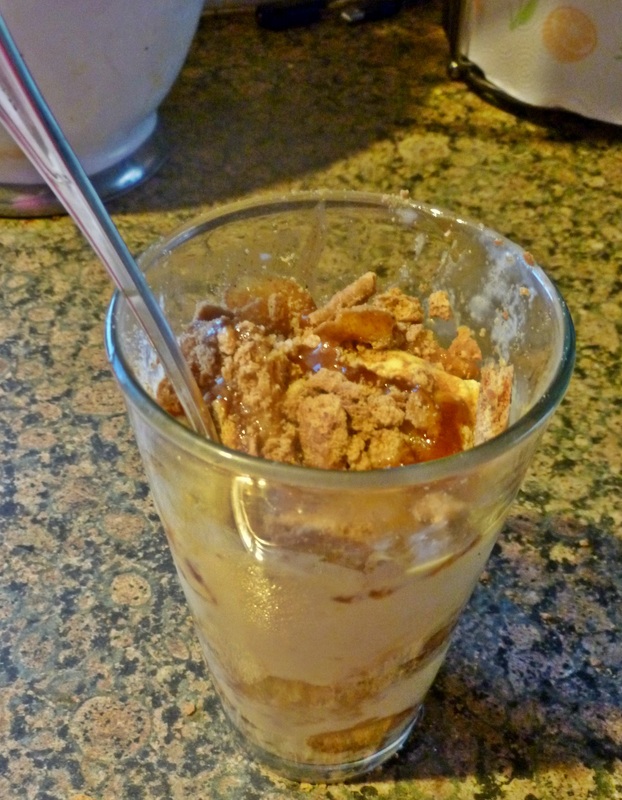 Begin to layer your parfait: crushed graham cracker as “crust”, spoonful of hot apple mix as “pie feeling”, and scoop of ice cream “a’la mode”. Repeat. Top with crushed graham cracker, remaining apples, and as much of the syrup as you can get out of the pan. 4. Enjoy and try to not feel guilty about keeping it to yourself. Anyway- all of that work was going to be worth it to me- because we were on our way to a great spot for picking huckleberries. Visions of pancakes, mikshakes, pies, cobblers, tarts, and jellies were dancing in my head. 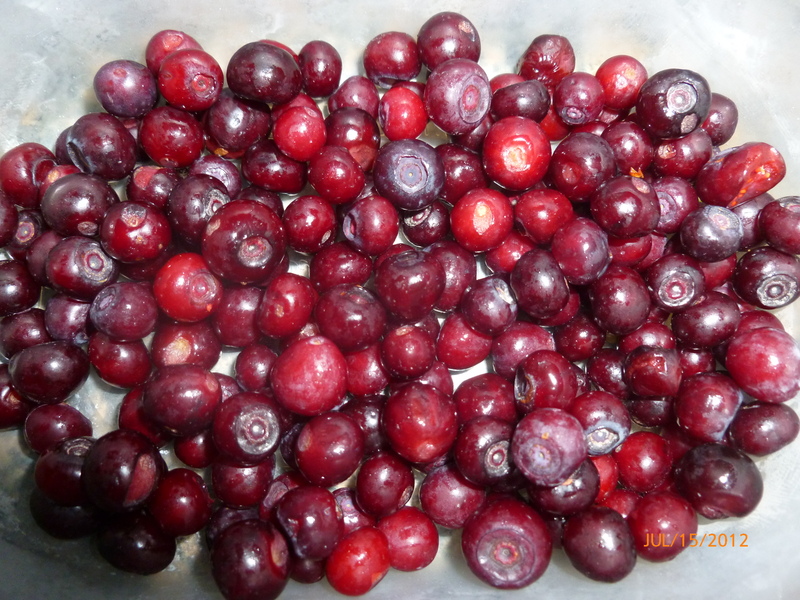 I was so anxious for the reddish, bluish, purplish fruits to be filling our buckets! And I was so excited to be spending some time away from the world with my family in the nice and peaceful forest land without too much worry or care and only fun times ahead. Now picture that little bubble of excitement and thought floating above my head like in a cartoon- and take an imaginary dart gun and blow a dart right into it to pop it. That’s pretty much how our trip went. First- Friday was an incredibly busy day at the office. I had no time to take a quick lunch to make sure I could pick up ice for the food chest- so that was going to have to wait until I got off. When I got off, I got a call from my husband stating he had fallen into a lake while helping a friend get a sinking boat out of the water. He wanted me to pick him up flip flops since his shoes were wet. Poor guy. So I got ice for the food, then I drove to a couple places before finally finding some flip flops. 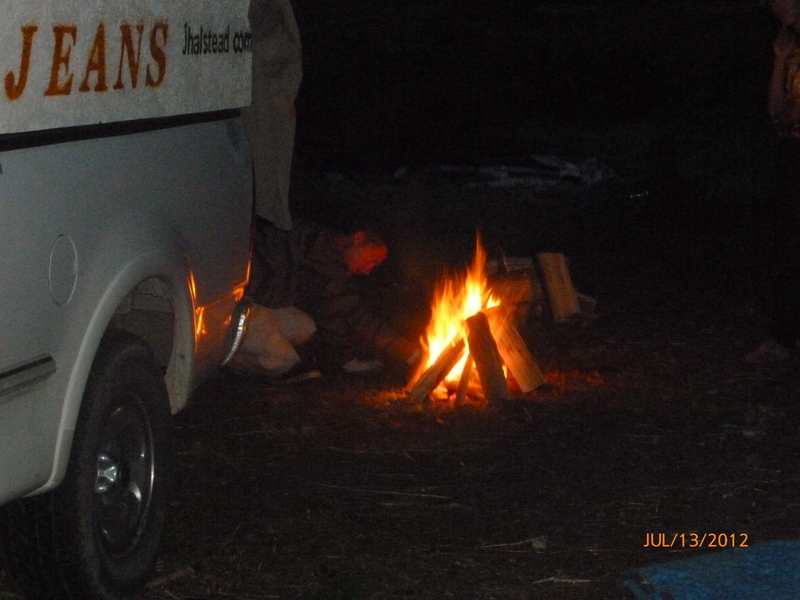 Then I picked up my kiddos and we made our way to the camp spot about an hour later than expected. I thought- oh well, that’s ok- we’ll have all day the next day. So we got to the spot and got settled. The kids ran around and played for a bit while we set up our tents. The fire wouldn’t start for a couple of hours so we had a 10pm dinner. Even that’s ok! It was still a great roasted hot dog and s’more dinner! Then I tucked my kids in their tent and joined my husband in ours. Not 20 minutes later there were LOUD cracks of thunder and HUGE flashes of lightning. I ended up with the children and both dogs in the other tent to try and keep everyone soothed. The storm, along with rain, lasted ALL night long. There was maybe an hour of sleep we got in between the storm noises, children’s worry questions, and dogs barking and moving around. Not to mention the mosquito bites… Ugh! When we got up in the morning everything was soaked. We quickly changed into the clothes that were only a bit damp from the rainwater soaking into the tents and getting all over our packs. Then we sat and tried to be patient while waiting for a fire to get started. While my husband worked on that terrible task with wet wood, I changed my mind on waiting and took the kids out to start the berry picking. I figured we’d probably warm up and dry up faster if we were walking now that the sun was coming out. We were so excited because the berries- though not quite ready- were plentiful and large! We got a few handfuls before my husband started walking up to join us. When my kids spotted him they were anxious to show off how much they put into their buckets- and here’s where the last straw of bad luck for our camping trip occurred. As my daughter ran down the dirt road towards my husband, she tripped and fell into the ditch area and a stick hit the front of her leg. Both my husband and I ran towards her and lifted up her pants as she was crying. We found a 2 1/2″ gash that was about 1/4″ deep and split wide open. She was blessed that it didn’t go deeper because there wasn’t much blood, but I looked at my husband and said we needed to go now. After bandaging up my baby’s leg with some first aid supplies as my husband held her in his arms, I took the 1 1/2 hour drive down to the emergency room with both my kids. 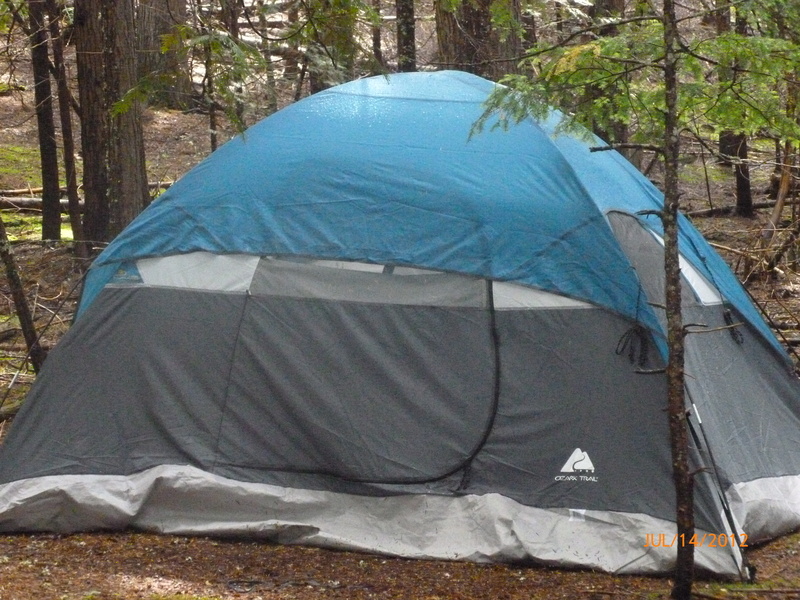 My husband was stuck with the task of packing up the campsite but I am so thankful that he did that. My poor little girl was so nervous and scared. She was okay the whole way to the emergency room- but once she was on the operating room table she panicked. Huge tears flowed, and high pitch screams entered my ears when she got shots of numbing medicine- but she did such a good job of staying still with my holding her down. And thanks to that numbing medicine, she didn’t feel any of the 12 stitches the doctor used to fix up her leg. So- there was our camping trip. Although there was a lot of “bad” that happened- it all turned out ok. We still built memories (how many can say they camped through a thunder and lightning storm?). We still got enough berries for milkshakes and pancakes. 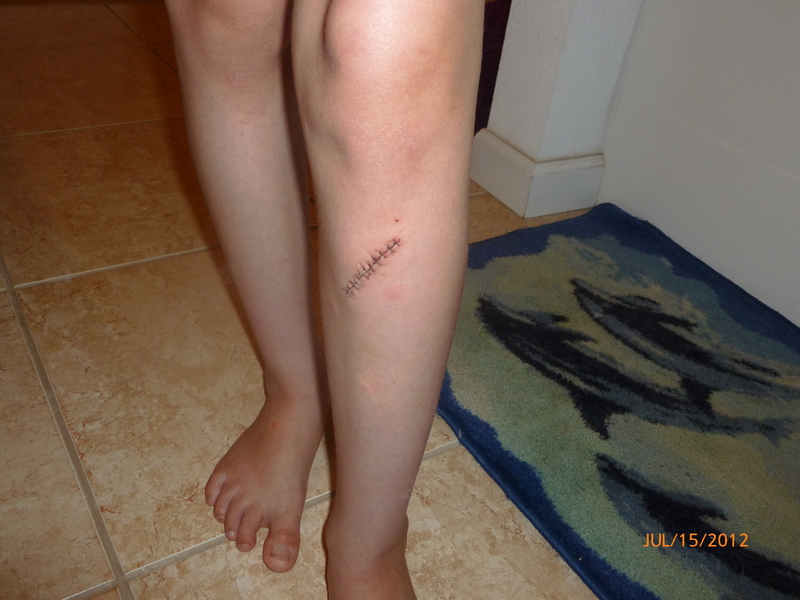 And my daughter’s leg was able to be fixed easily- it could have been much worse. I am writing this post in honor of my featured artist for the week on my website- Nora Bartlett with Lollypaws Dog Bakery. I found the cutest 4th of July dog treat gift box in her shop that made me just laugh out loud while thinking of how much my dogs would LOVE something like this! My dogs aren’t very spoiled- key word “very”. My dogs get to sleep inside (not something most of my dogs as a child got to experience). They get to eat the occasional leftovers from our dinner plates. They get to run around our property for hours chasing birds, gophers, and our goats and pig. And our dogs get a treat before we leave the house each day. That’s not too spoiled is it? The way I figure it: Even dogs deserve to have a delectable moment! I am definetaly saving Nora’s shop information for future reference. For example- we may decide to celebrate one of our dogs’ birthdays! 🙂 Or Christmas boxes would be great!!! Why don’t you check out the information I posted for Nora here: http://delightfullyperceptive.com/perceptive_delectables/featured_food_designer? You can also visit her Etsy shop directly… http://www.etsy.com/shop/Lollypaws. Happy 4th and hope your pooches enjoy the day too! Let Nora know I sent you! Delightfully Perceptive Designs on Facebook!